If your idea of a vacation is to escape into a laid-back vibe with misty mornings, long stretches of beautiful blossoms to gladden your heart, embark no further than Ooty, tucked away in the Queen of Hills, the Nilgiris in Tamil Nadu. The inviting weather and lush green cover has made Ooty Tourism popular. There are many places to visit in Ooty. 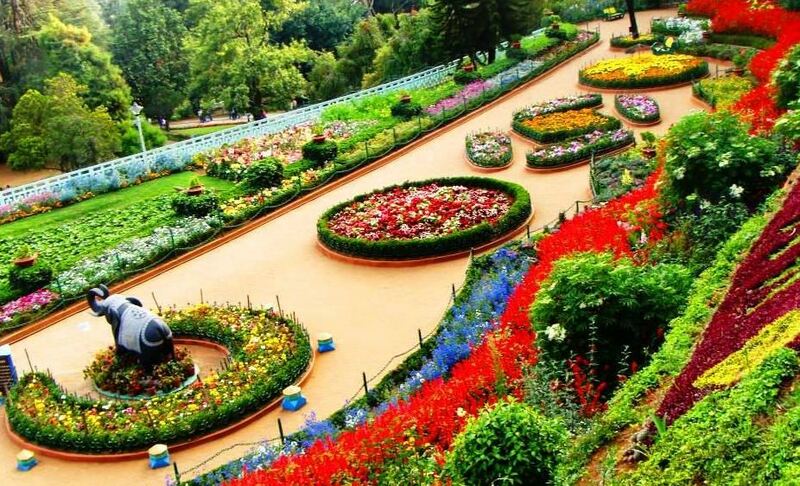 The Tamil Nadu Horticulture Department has dedicated 55 hectares towards the botanical garden in Ooty. At a cool, temperate climate at elevations of 2250-2500 sq feet above sea level, the temperatures are between 0 and 28 degrees Celsius. It was first established in 1848 by the British. Initially used for the cultivation and supply of vegetables for the British markets, a small stretch of land was converted into a public garden by the horticultural society when the vegetable supply did not generate profit. Today it is the pride of Ooty Tourism. There are thousands of trees, plants, shrubs and ferns, herbal and bonsai plants at the botanical garden. Absolutely pollution-free, the full bloom flowers on terrace garden slopes of the Doddabetta hill are among the best places to visit in Ooty. The botanical garden in Ooty is clean and impeccably maintained driving Ooty Tourism. 1. Plucking flowers is not allowed. There is a minimum entry fee of 30 rupees per adult and 15 for children. There is an additional charge of 30 rupees for a camera and 100 INR for a video shoot. 2. There is a fossilised tree which is believed to be 20 million years old. 3. There are 6 sections – lower garden, new garden, Italian garden, nursery flower bed garden and the fountain terrace, all of which form some of the most enchanting places to visit in Ooty. 4. Lawns, ponds with various aquatic species, and flower beds are spread all over the garden. 5. The Annual Flower Show is during May. Planning a trip to Ooty at this time would be perfect for experiencing fine weather and for feasting your eyes on the best flower exhibits. 6. The average rainfall is about 140 centimetres and winters in the months of November and December are frosty. 7. The botanical garden in Ooty is a photographer’s delight. If you have a camera, bring it along for sure. 8. Summer months are the best. However, no matter which month you visit, bring along some warm clothing and always carry a torch, and waterproof picnic blanket to spread on the moist lawns. 9. Coimbatore is the nearest city to the hill station, about 2.5 hours away. 10. Timings: 7 AM to 6:30 PM. The sprawling lawns in the lower garden are soothing for the feet. The springy bounce they provide is the perfect antidote for tired soles, a special property of the blades of Kikuyu grass. On the way to the Raj Bhavan is the fern house, housing about 127 species of fern. Don’t miss the carpet bed map of India decorated and laid out with varieties of plants. The New Garden comprises the coveted rose beds in a myriad of colours. The rose blooms are planted so that they follow the slopes and contours of the region. There are at least a few hundred species of roses here including Floribunda and Polyanthas roses. More carpet beds of emblems of India, Tamil Nadu, etc. have been beautifully designed with flowers. This area was first laid out and tended by war prisoners of WW-1 from Italy. These Italian prisoners were first shifted to Ooty, where they grew plants all over. Flowers like asters, begonias, dahlia, balsams, cosmos and zinnia adorn this garden. The nurseries are both indoors and outdoors. The indoor nurseries are situated inside eight glasshouses. The outdoor nurseries are on the terrace gardens along the hill slopes and are specifically used to grow exotic plants, cut flowers, seeds and other experimentation. The glasshouses are filled with stunning begonias, cacti, bulbous, orchids and ferns. These potted plants are fast-moving, and there is a continuous supply of them into and out of the conservatories. The conservatories came up in the year 1912. Flowering plants in the conservatories include both perennials and annuals like the geranium, chrysanthemum, primulas, coleus, calceolaria, gloxinia, cineraria, etc. Established in 1992, the arboretum comprises exotic and indigenous plants which are maintained by the Department of Horticulture with Hill Area Development Programme funds. The area near the Ooty lake was a dump for industrial wastes. However, the Hill Area Development Programme developed a complete infrastructure to clean and set up the Arboretum with permanent fencing around it. At least 80 trees now exist in the arboretum beside other exotic plants and species. Explore the botanical garden in Ooty and all that Ooty tourism has to offer by staying at nearby hotels and resorts. Club Mahindra’s property in Ooty is one of the best in terms of elegant and spacious rooms and the best of modern facilities. Do not miss the in-house restaurant which serves delicious local recipes from Tamil Nadu by expert chefs. Read more about the resort by checking the online Club Mahindra reviews and plan your next holiday to Ooty to experience heaven on earth! So what are you waiting for? Plan a vacation with Club Mahindra today & have a pleasant and memorable stay at Derby Green resort in Ooty with family. This entry was posted in Ooty and tagged botanical garden in ooty, gardens in ooty city, gardens to visit in ooty, ooty botanical garden. Bookmark the permalink.